While making the bed in the fifth wheel, I bumped into the side curtain hold down and it broke. Since my fifth wheel was a 2013 I thought I may have to get the part from the manufacturer. I searched on line and found Dyer's carried the exact part I needed at a reasonable price. I quickly ordered 2 sets in case I made the same mistake. Dyer's shipped out the part in the same week and I received it in 2 days. The next time I need a part I'm going to check Dyer's first. I recommend this store very highly. The quality of people are the best. 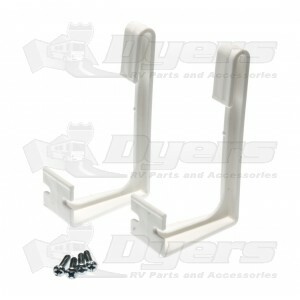 We have been looking for these curtain brackets for a long time , so glad we found Dyers, on line. they are now saved in our favorites. Just a small plastic bracket, but necessary. The order was handled in a timely manner and we were pleased with the delivery time and the condition of the product. Dyers is in our "favorites" for future needs.